Whether a Bandon resident or visitor, everyone needs exercise to be healthy and to feel rejuvenated and renewed! Bandon has three fitness centers for structured indoor workouts, and lots of options for getting outdoors for exercise. Your full-service gym, Bandon Fitness offers cardiovascular and strength equipment, functional training, yoga classes, tailor-made training programs, a sauna, and easy access to a variety of instructional exercise DVDs plus a large room for individuals or groups to use them, all included in the membership cost. In addition to exercise equipment, the building is filled with helpful charts and tips as well as inspirational pictures and quotes. It is staffed during the day, 7 days a week, but members have 24/7 access. Non-members can purchase daily, weekly or monthly passes. Call or visit their website for more information. A variety of fun and challenging group exercise classes are available to members at Core 10 Fitness. Pilates, spin, and F.I.T. are only a few of the many offerings! In addition, personal trainers offer fitness training to help people of all ages and abilities meet their fitness goals. For more information, including rates and a class schedule, call or visit their website. Fast & Fit is a ladies’ only circuit training center in Bandon! Stop by or give them a call for information. If you prefer to get your exercise outdoors, Bandon is a great town for walking, jogging, bicycling, windsurfing and kiteboarding. 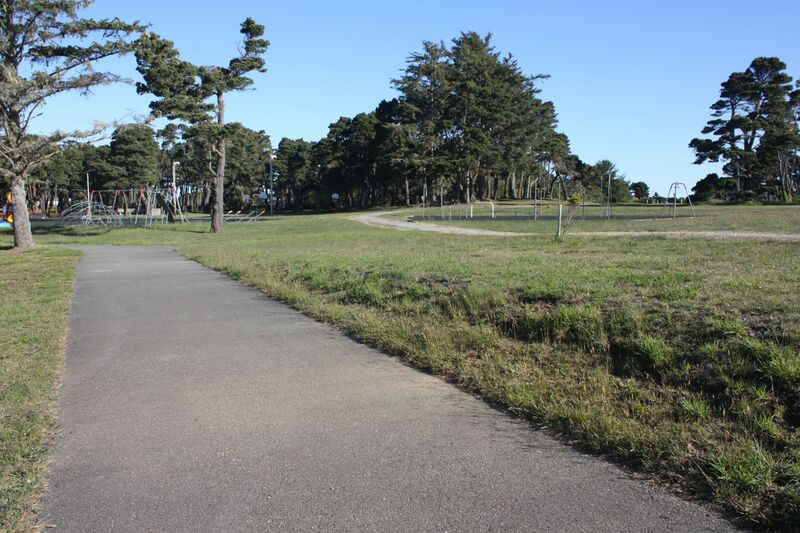 In town, pedestrians can head for the Bandon City Park, located on 11th St. only a quarter mile from beach access. A loop around the park on flat paved paths is a little under .4 mile. If you’d like to add a walk on the beach, continue west on 11th Street and walk another quarter mile to Kroenberg County Park where you’ll find stairs that lead to beautiful beaches. Walking along the harbor and down the streets of Old Town is a great way to get some exercise and fresh air, and you can get your fill of people watching while you’re at it. Old Town starts under the arch at the intersection of Highway 101 and Delaware Ave. SE. Click here for a map of Old Town Bandon. The ability to walk and jog on the beach is one of the best things about living in and visiting Bandon. See our Hiking Page for more information about walking on the beaches. Stay for a while on the Hiking Page if you are interested in a hike that is well suited for your ability and ambition. Many people find pleasure in riding their bikes on the gently rolling hills of Beach Loop Drive. Beach Loop Drive is approximately 3 miles from end to end, but it is quite easy to add on by continuing to the north down into Old Town or to the south to the highway. The road goes along the beach, and riders are treated to many nice views. It is a lightly traveled street, but traffic does pick up during the tourist season, so be on the lookout for cars. Beach Loop Drive and Rosa Rd. Riders can make a moderately easy loop that incorporates the ocean views of Beach Loop Drive and the rural color of Rosa Rd. Starting in Old Town, ride up the hill on Edison St., turn west on 4th St. and continue onto Ocean Drive and then 7th St., and the road becomes Beach Loop Drive. Ride south on Beach Loop Drive, stopping if you’d like for views and photos at Face Rock State Park, Devil’s Kitchen and China Creek. The road eventually turns east and meets Highway 101. Turn right (south) on 101, then head east on Twomile Rd. in less than a mile. In about 1/2 mile, you will reach a T intersection with Rosa Rd. Turn left (north) and ride past cranberry bogs and residences. You will come to another T intersection in about 4 miles at 11th St. Turn left (west) and ride another 1/2 mile to Highway 101. Turn right (north) to head back down to Old Town. This loop is approximately 11.5 miles. Bicyclists can find an easy, nicely rolling ride by driving just north of Bandon, over the bridge, to North Bank Lane on the east side of the highway. A park about a mile down the road is a good spot for staging. North Bank Lane is a quiet and sparsely traveled alternative route to Coquille. It follows the Coquille River and winds through pastureland and ranches before connecting with Highway 42. As it heads east from the ocean, the temperature increases by up to 10 degrees in the spring and summer while riding along. Riding all the way to Highway 42 and back is 36 miles round trip, but riders can go just as far as they want before turning around. Although traffic is light on this route, the road is winding and has no shoulder, so be very cautious of cars. Mornings and weekends are the best times for this route. For those looking for a challenging ride with elevation gain, Langlois Mountain Rd. offers a workout. To find this challenge, head south from Bandon about 14 miles to the small community of Langlois. Turn east (left) on Langlois Mountain Rd., and the road starts uphill right away. The challenge does not come without reward, however, riders are treated to views of lakes, streams, and the ocean as well as ranchlands. There is a parking area 2.6 miles up the road past the most extreme climb. Parking and riding from there still provides a ride with plenty of rolling hills. The road dead ends at a gate 9.5 miles up the road for a maximum of 19 miles on Langlois Mountain Rd. For many more road riding options in the area, see the Two Wheel Oregon website, and zoom in on the Bandon area. Riders looking for a bigger mileage day might choose to ride on the highway north or south to one of Bandon’s neighboring towns. 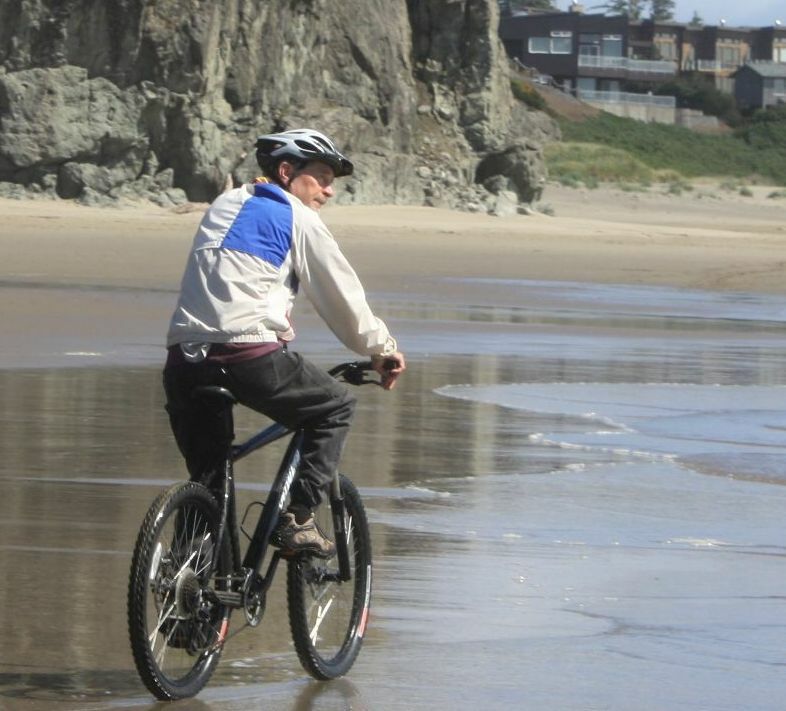 For information about riding on the Oregon Coast, click on the following links. Local author Tom Baake’s book Oregon South Coast Bike Ride Guide is a great resource for finding road and mountain bike rides in the South Coast area. Need to rent a bike? Do you need bike supplies, repairs, or help? Need to talk to someone about where to ride in the area? Go see one Karl or one of the other experienced folks at South Coast Bicycles. They are located on the north end of town on Highway 101 at 805 2nd St. NE. You can also visit their website or give them a call at 541-347-1995. See our Windsurfing and Kiteboarding Page for more information on these exciting and fun opportunities in the area.